Coding was once considered to be a nerdy pursuit. But in truth, learning to code not only opens a wide range of lucrative career paths, it is excellent for logic and problem solving skills. In fact, the new national curriculum for England now requires children as young as five learn to write and develop computer programs. Many kids already have an innate aptitude for coding, but haven't had an opportunity to do so. Here are some websites to get your child going. They're either free or are free to try. These sites teach basic concepts of programming through kid-friendly games, activities, and interfaces. Scratch – Designed specifically for kids, Scratch is a visual programming environment that invites kids to program using blocks of code, much like they build with LEGO or wooden blocks. They can create stories, games, and other projects and then share them online. CodeSpells – CodeSpells is a game that you can download to help kids learn Java. Kids play as a wizard who must help the local gnome population by casting spells. 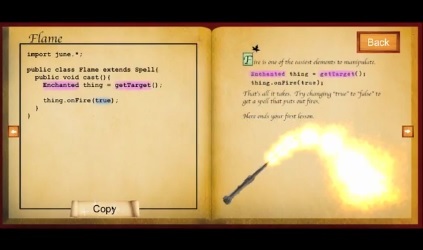 The spells are written by the players in Java, so kids must learn the basics of the language in order to progress through the game. This is a nice intro for kids who haven’t yet been bitten by the coding bug and a good starting point for tweens. These sites are all about learning a programming language or computer science as a whole. App Inventor – App Inventor allows users to create their own Android apps. It has a visual interface and code-blocks, like Scratch, but is better suited to a slightly older audience. Kids can test apps on their own Android phone or use the built in emulator. App Inventor won’t teach them how to code, but it will help kids put together an app easily while learning the fundamentals along the way. Code School – Code School offers playful, yet instructive and interactive courses in Ruby, JavaScirpt, HTML/CSS, and iOS. Tweens and older should find the free introductions to be fun and it’s a good way to test out their interest before actually enrolling them. Enrolling in Code School (with full access to course and videos) is $25 per month. Remember that coding without a goal can get old pretty quickly. If possible, take some time to sit with your kids as they start to learn to code, or make a plan to learn together. Help them think of fun or useful programs, websites, or apps they could design, and then make sure to cheer them on along the way. And if you want to try coding away from the computer, look into the LEGO Mindstorm EV3, a programmable robot construction set coming this fall. Before signing them up, don’t forget to chat with them about basic Internet safety. Many of these sites have communities for users to ask for help and share ideas. It’s important that kids understand that they will be interacting with adults and know what is – and what isn’t – appropriate to share. Once that’s out of the way, just have fun! Hey Heidi. Gregg Pollack, founder of Code School here. Thanks for featuring us in your list. I have a 7 and 5 year old and they’ve absolutely loved the Lego Wedo for learning how to program. Mindstorms I think would have been too advanced. Definitely check it out for kids under 10.